If you’ve ever tried to do the manual outreach of link building you know how hard it can be. You can do email outreach to dozens or 100's of sites and get little to no responses. More often than not, I’ve learned that the reason for this is that you have chosen a poor site to perform outreach too. 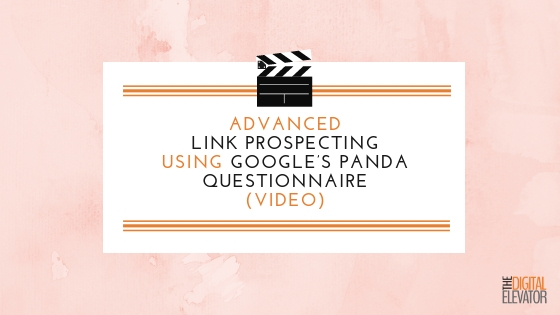 In today’s video, (which is something of an advanced SEO tutorial) I’ll show you 11 quick link prospecting hacks -- in part based on Google’s Panda Questionnaire -- that will save you time, help you filter your link building prospecting sites more quickly, and ultimately, give you more outreach success, resulting in better rankings and more traffic. What is the Panda Questionnaire? Before we begin, here is some context to using the Google Panda Questionnaire and why the questions that were used to help people vet “high-quality” sites are some of the same ones we use for building high-quality links. Google gave questions to a group of people, had them assess a bunch of websites, and then ran machine learning algorithms on top of the human data. In effect, these questions helped move up or down search results based on human feedback. The primary factory of “what makes a quality website” was incorporated into Google’s Panda algorithm. You can use variations of these same questions when link prospecting to ensure you are getting the most value out of your link building efforts. These are some of those Panda questions mixed in with some of our own link prospecting questions. Is the site’s content you want to build links from similar in scope or nature to that of your site? If so, that means it is likely a strong link candidate. Now, not all sites have to cover the same types content as yours, but it definitely is a preference. For example, if you run a fitness website, you could make a connection with a nutrition website as the two main focuses of content -- fitness and nutrition -- are related. You can easily tell if a site looks credible or not. If it doesn’t, don’t waste your time prospecting it. Sites that cover all sorts of different, irrelevant content are usually a waste of time and link farms. On the other hand, if the content seems very credible, well-researched, and professionally made, then it likely makes for a good link prospect. Would you give this site your credit card info? We’ve all been to websites that sell products or services that we instantly have a sense of trust with. Some of these trust signals may include an SSL certificate, professional design, and a strong brand presence. If the site doesn’t pass the “smell test” of one that you’d make a purchase from, scratch it from your link outreach list. Does the domain rating match what you are looking for? At Digital Elevator, we use the Ahrefs Chrome extension to quickly see the Domain Rating (DR) of a website. You can also use the MozBar which displays Domain Authority. Internally, when we do link prospecting, we’ll generally set a floor for the DR of the sites we want to get links from. For example, often this floor is a DR 30 meaning that a site with a DR under 30 will be thrown out immediately. This is especially true if you are using guest posting as a link building strategy - you don’t want to dedicate a bunch of time to a site that demands 1,000 word posts when they have a low domain authority. The idea is to prospect quickly, and that also means that you don’t want to waste time on a site that may give you a link if the link is weak and doesn’t provide the SEO value that you want in your link building efforts. Is the site written by subject matter experts? Does the site seem to let anyone guest post? Do the writers seem to conduct thorough research and have insightful content? Read through a blog or two to get an idea of the quality. If it is choppy and littered with grammar errors, it probably is a poor outreach partner for you. Does the site get any traffic for relevant keywords? Check the keywords the target site is ranking for to determine if it actually gets any traffic. We use Ahrefs to do this, but there are a number of SEO software tools you can use. A trustworthy site will generally rank for a number of keywords whereas a spammy site will likely rank for none. You have to watch out for spammy sites that have artificially inflated DR; these links look good on paper but are unlikely to help your efforts. Does the site regularly post or are they an active brand? Is there actually a person you can contact (rather than just a generic email)? Many sites hide their email because they don’t want to get spammed. While you can use a service like Hunter to find emails, if there is no real contact information you may want to scratch them off the list. Does the site have a “Sponsored Post” option? This means they are big enough to get money for their posts and means, technically, it's only an advertising opportunity. If you do outreach to these types of sites, expect them to respond with a “yes, but it will cost you ‘x’” for a post. Is the site a really large brand? Large brands typically have in-house teams that create content and are unlikely to respond to any link outreach. While you can certainly try to perform outreach to them, I generally find them unlikely to respond. What other vetting questions do you use to prospect sites? Please let me know in the comments.